Quorum Review is one of the largest independent review boards in the country who provide ethical review to the human clinical trials industry. They hired UpTop to help them improve their workflow and tools used in their many and very fast paced internal review board meetings. The turnaround time we had on this project was only a couple of weeks, so we had to work very quickly. A unified app that consolidated and streamlined the process and tools used to prepare, document and access meetings and reports conducted by the Board. After reviewing the build we received kudos from the IRB Chair saying the app is easy to use and a great improvement over their current portal. Ramping Up and Reviewing Client-made mockups. The client had created mockups to help us get a better understanding of what they were looking for in this new app creation. With enough information on scope and expectations, constraints and scope we were able to hit the ground running. I realized pretty quickly that, with the very tight deadline, we needed to come up with a solution that would actually be beneficial to the end users. I quickly created an information architecture, through card sorting, that I would then use as a foundation for the design moving forward. With the information architecture I created and the background I learned from the project ramp up, I sketched out a high-level user flow to review with the PM’s and developer. After validating this approach we scheduled a meeting with a number of the end user employees for whom this app was being created. 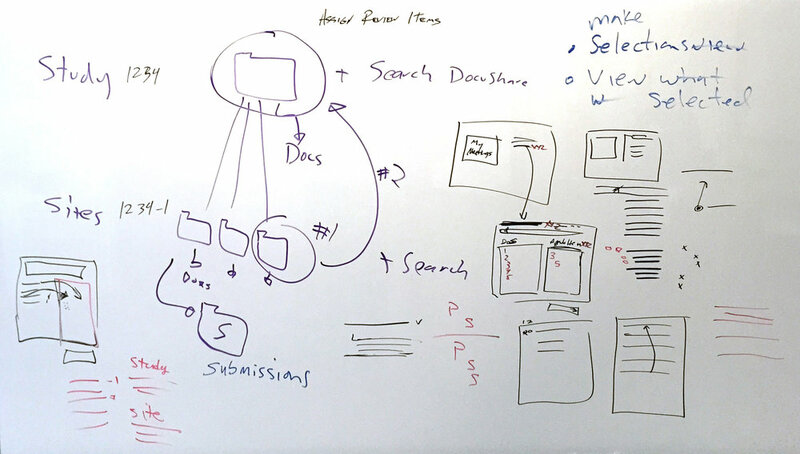 I conducted a whiteboarding session with the end users as a way to actively interview them on their current processes and to test an initial solution with them directly. I presented the overarching structure and flow I had created while taking notes of their feedback along the way. The next step was to dive deeper into the functionality of the app. I had to come up with solutions that would fit the users needs of both preparing and documenting meetings. Again, I reviewed my concepts with the PM’s and developer before sharing them with the larger group of end users to get their reactions and feedback. The final solution of this app needed to also meet the needs of another group of users, who’s main task was to prepare meetings by scheduling and populating meetings with proper documents, review materials, and attendees. I had the opportunity to meet with a large group of these users, as well, to get their feedback. But, first, I did more ideation on possible solutions. I used this review session with this group of users to learn more about the tasks they perform and what they were expecting from this app. Their insight helped fine tune the direction of this section of the app into something they would find as an improvement to their workflow. 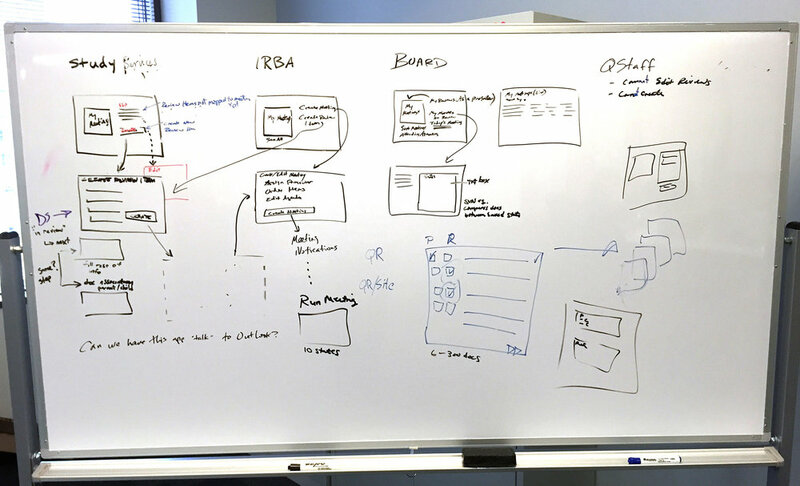 After the user interviews/whiteboarding sessions, we decided to focus on a dashboard design for the app. This made sense because it was the one core screen all users would interact with on a dailty basis. But, there was uncertainty with which design direction to pursue. So, to quickly make a solid decision, we created wireframes of the two leading designs and presented them to the users. With more user input we were able to choose a direction and build out more full-fledged wireframes of the dashboard and it’s different user states. 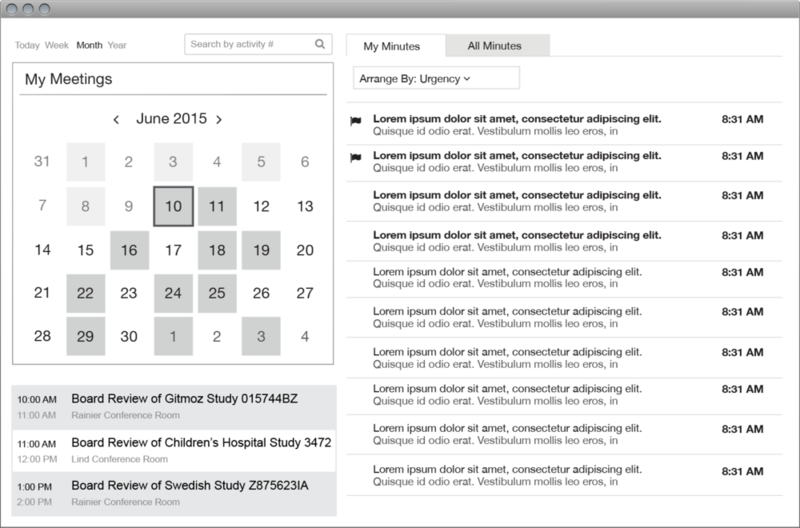 The heart of this app is the meetings page where we created a framework that could accomodate all of the different user states throughout the whole life of a meeting; from preparing, to documenting and finally to publication and review. With the final design approved, fully annotated comps were created for the final handoff to the devleopers to inmplement.